I'm still kind of dazed by tonight's episode of Doctor Who. I can't decide if it's a fantastic work of genius or a shaggy-dog story. Maybe both. But it's clearly Steven Moffat turning all of his favorite tropes up to 11. And I came away feeling, more than ever, as though there's not much point debating Moffat's Who. That is, by now it's pretty clear what Steven Moffat's Doctor Who is going to be about, and you either like it or you don't. Moffat has staked out a few ideas and stylistic tics that he's going to keep mining, and he's obviously having fun with them. To some extent, "Listen" is Moffat lampshading his own tropes, but this episode also seems to be a bold statement that Moffat can still find fresh inspiration in his favorite territory. It's hard to summarize the plot of "Listen." It's either a story about the Doctor getting bored and discovering/inventing a new monster — or it's a story about the Doctor dimly remembering his childhood trauma, when he was visited by Clara, and investigating it. 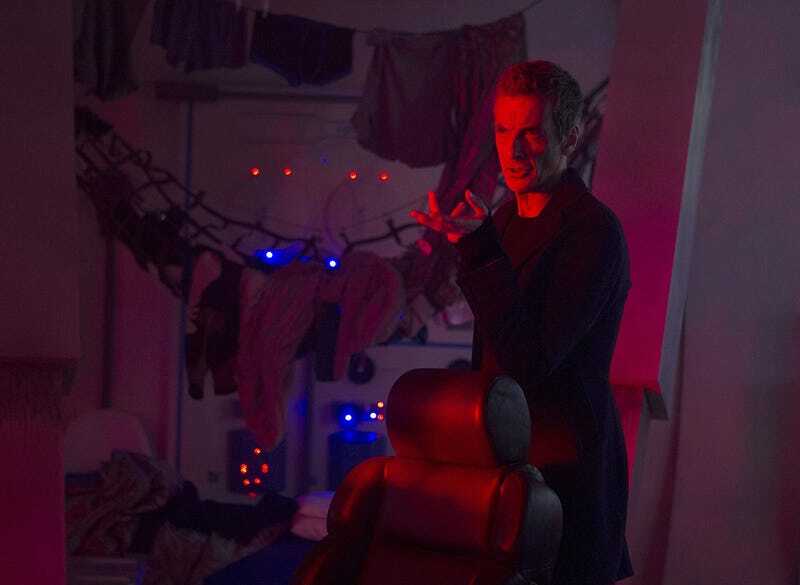 And in the process, the Doctor causes the visit from Clara that he remembers. The Doctor fixates on the notion that everybody has the same dream, of something under their bed. (Everybody who has a bed, presumably.) Something reaches out and grabs your feet, but then it's gone when you look for it. And maybe this is actually an experience that everybody has had? The Doctor decides to investigate his hypothesis, and drags Clara into it — in the midst of her disastrous date with Danny Pink, her coworker. He ties her mind into the TARDIS computer, with the safeguards off, to find the moment where she had this dream — but instead, they visit Danny's childhood, and then Danny's great-grandson Orson Pink (who tests a time machine and ends up at the end of the universe) and finally, the Doctor's own childhood, when he has the experience he described for himself. The clever, quotable dialogue and keenly observed moments. Let's just acknowledge that first off — Moffat is really good at funny bits. There are a lot of them in this episode, and the Doctor in particular is well served with comic material. The running joke about Clara's eyes being too big, and him not understanding her date. The Doctor thinking Clara's already taken off her makeup. Also, the Doctor talking to the man at the boys' home about coffee going missing, and then stealing the man's coffee. "Have you seen the size of human brains? They're hilarious." Moffat may be the most quotable Who writer, second only to Douglas Adams. The relationship comedy against a huge backdrop. Moffat made an early splash with the show Coupling, and he often seems to be happiest when he's writing a romantic relationship dramedy. In particular, situations where a man is at his most vulnerable and passionate, and a woman is trampling over the man's delicate feelings without meaning to. This time around, it's Danny's trauma from his past as a soldier, and his annoyance that everybody keeps thinking he just killed people. When in fact, he dug a lot of wells. Clara first walks out on Danny and then later reveals she knows his real name, Rupert (because she's just visited him as a small child.) And their relationship is already being set up to be as epic, in its own way, as Amy and Rory's was. We know that Danny's descendant Orson (who's probably also Clara's descendant) will be the first (official) human time-traveler. And this probably all ties in with how Missy went to so much trouble to maneuver Clara and the Doctor together in "Bells of St. John." It's all going to come back to the Doctor, one way or the other. Moffat is just a master of writing relationships, and of capturing the little moments of anguish and openness that are the building blocks of intimacy. It's very much his wheelhouse. Like the bit in this episode where Danny and Clara agree they're not going to talk about work, and then end up talking about work. And the mechanics of their on-again, off-again argument, and way it comes out of their nervousness and self-sabotage. Moffat loves the moment where you think you're dealing with one person, but it's actually someone else. Especially when he's got two male leads to play with. In the Rory era, he was always making you think something was about the Doctor when it was actually about Rory, and occasionally vice versa. There are two of these in last night's episode — first, Clara thinks that the Doctor is tromping around the restaurant where she's on her date in a spacesuit. But it's actually Orson, Danny's time-traveling descendant. And second, at the end, we think the crying boy in his bed is Danny once again, but it's actually the Baby Doctor. This episode is full of closed loops — the Doctor tells Young Danny that fear is a superpower, because he heard it as a child from Clara, who in turn heard it from the Doctor. Danny is a soldier when we first meet him, but it turns out that he may have become a soldier because of something Clara told Young Danny about his toy soldiers protecting him, led by "Dan the Soldier Man." People's choices — including Danny's previous career choice — are somewhat deterministic, because time travel makes pawns of us all. I personally am not a fan of "closed loop" time travel stories, because they're usually the same story in the end. And I like storytelling that gives characters agency — Back to the Future, Terminator 2, Looper and Moffat's own "Day of the Doctor" anniversary special are good examples of time travel stories that allow characters to make choices instead of being puppets. But I know a lot of people prefer closed-loop or deterministic time-travel stories, and I respect that. Again, by this point you're mostly going to know whether Moffat's approach to time-travel storytelling is your cup of tea or not. Meeting people as adults and as children. Chances are if you meet someone as a grown-up in a Moffat Who epic, you'll eventually meet him or her as a child. We've already seen the Doctor spying on Baby Clara during the Impossible Girl arc. And we spent a lot of time with young Amelia Pond. Moffat pioneered this in his beloved season-two episode "The Girl in the Fireplace," and it's an obvious use of time-travel. Also, "Christmas Carol." Moffat isn't just fascinated by meeting people at different ends of their timestream — he likes that moment where the friend or lover becomes a surrogate parent. This happens a lot in this episode. Clara becomes a kind of surrogate mother figure to both Young Rupert/Danny and the Baby Doctor, and this turns her into a better friend or lover to the grown-up versions of them. This is a big one. Since he scored such success with the Weeping Angels, who can only move when they're not seen, Moffat has experimented with the Vashta Nerada, who can only be detected by counting shadows, the Perception Threshold that only lets you see things out of the corner of your eye, the Silence, who can only be remembered when seen, and a couple other things. This time, it's the perfect hiding monsters that the Doctor says must not be seen — because if you ever see them, they'll do something terrible. The ambiguity in this episode pushes Moffat's preoccupation with the unseeable to its absolute limit, because we'll probably never know if there actually was a monster in Danny's bedroom, or if the noises at the end of the universe were anything real. I'm inclined to think it's all just the Doctor's childhood trauma playing out. Of course, it's entirely possible that Moffat will revisit the nameless "monster" from this episode later this season, or at some other time — and we'll find out that it was real all along. Moffat, for the most part, is not really interested in villains, other than as a mechanism to set up a situation that his main characters have to cope with. You'll almost never see a Moffat-scripted villain pull one last ace out of their sleeve or do something in the final act to raise the stakes. "The Beast Below" sets up the Smilers as a huge threat, and then they vanish. There's no real villain present in "The Big Bang," and barely any villain moments in "The Wedding of River Song." "Day of the Doctor" throws in a Zygon plot, to cover up the fact that it otherwise is villain-free. Moffat's villains usually set things in motion, rather than playing an active, ongoing role in the story. If their plans require their active involvement (like the Great Intelligence or the Weeping Angels) it's usually very linear. The bits where Clara comforts Young Danny and the Young Doctor are really beautifully done, and the notion that "fear is a superpower" is astonishing and great. And the way the episode ties in the Doctor's childhood sadness with the backstory of John Hurt's War Doctor — because the barn where the Young Doctor goes to cry is the same one where John Hurt goes to set off the Moment — is really fascinating. That's the thing about Moffat: He gets caught up in his clever storytelling tics and his nifty quippy comedy moments, but just when you least expect it, he's capable of crafting a genuinely touching moment. The final moments of this episode are actually quite spine-tingling, when Clara leaves Danny's old toy soldier (which has become a "family heirloom" to Orson) with the Gallifreyan infant. So for all its reliance on Moffat's old favorites, "Listen" is still something radically new: a bracing formal experiment that takes the format of Doctor Who to its furthest extremes, and gives us a vision of the Doctor we've never quite seen before. At the same time, whether you'll like it or not probably depends on how you feel about Moffat's usual toolbag. And that's something that may well have passed beyond the realm of debate, at this point.